You hit the nail on the head. I recently wrote a blog on being a shill. It requires two things. 1. incentive to spread information, 2. Information is contrary to scientific consensus. In this definition, Fagan, Mercola, Smith, Shiva, Hari, Oz and the rest are the real shills. 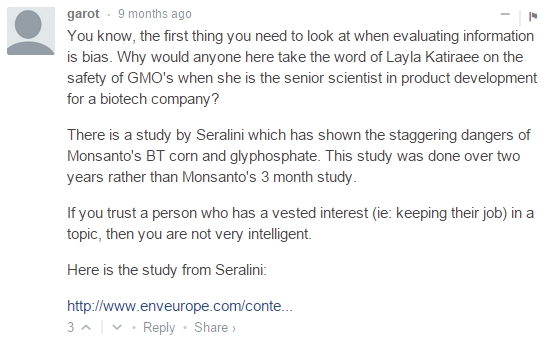 They profit from false or misleading information. My job (our job) is interpreting peer-reviewed science from a consensus for the public, for no compensation. Amazing how that is considered crooked. Exactly! I've often thought that a less scrupulous person would just jump on the "shill" bandwagon: there are speaker fees to be made, travel opportunities, etc. And the opportunities to create a business out of pseudoscience are seemingly endless. Great article. 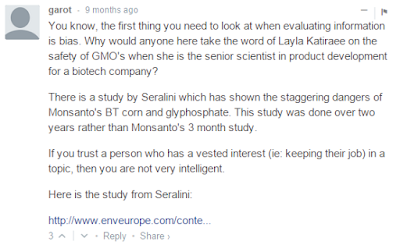 I'm curious to hear any thoughts you might have on pro-GMO advocates "taking ownership" of the term shill in internet arguments. 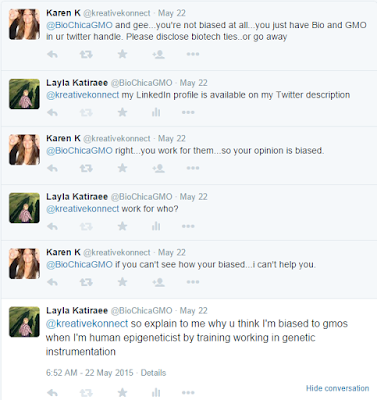 For example, the hashtag #shillarmy has gained popularity recently, partly in response to the Food Babe Army. It seems that hijacking the word in this way might take the power out of it and point out the ridiculousness of it being used so often, but I'm uncertain that it would be effective. Thoughts? Dr. Folta, if you're still around, I would be interested in your thoughts on this too. That's a great point and agree with you. I've seen a lot of clever ways that people have used to take the power out of the shill-gambit. There are plenty of memes and images of shill-iness: the most common one I've seen is a business card for a shill. Not only are these great ways to "take ownership" for the term as you pointed out, but also help diffuse tense situations when the shill-term is hurled at you. The last time I looked at our national organic magazine it had articles propounding the wonders of organic fertilisers etc. The authors run businesses supplying these supplements and also had paid advertisements in the same magazine. Somehow this double standard did not raise any alarm bells. Thank you for this. I want to provide insight into how the double standard exists. The problem is less intentional deception and more delusion. From the start, there is a belief that the badness of GMOs is so self-evident that no right thinking human being could possibly support them. Once you've watched (and accepted) The World According to Monsanto and Food, Inc. it is blindingly obvious that evil men are ruining the world and "if you aren't outraged you aren't paying attention". And once you're swept up in the fever of glyphomania, starting a business to meet the needs of your friends and family seems like the only ethical thing to do. There's this terrible poison and you're going to fight it and actually help people by selling them something. Wow. I had no idea about the homeopathic remedy. I agree with your previous comment. Figuring out someone's motive is difficult, and I think we should err on the side of caution and give them the benefit of the doubt. My guess would be that the vast majority of people who benefit or support pseudoscientific businesses probably believe in them whole-heartedly, whereas it's only a small fraction of individuals who create the business out of convenience. I don't think it's a coincidence that Jeffrey Smith and John Fagan come from the Maharishi cult. In their cases, replace the watching of The World According to Monsanto and Food, Inc. with accepting whatever Vedic dogmas their cult feeds them. That's where their bias comes from. The fact that they've managed to make a living from this, while a great incentive to continue seeing things a certain way, is probably secondary.